We have a GIRL!!!! I’m going to have a granddaughter!!!!!! Oh, dear Lord, I’m so excited I may explode! I just wanted to let you know!!!! That baby is going to be SPOILED. In a really good way! OMG! Such a special time for you all! That is the cutest little announcement card I’ve ever seen. I too am so happy for you! WOOOHOOOO!! Gigi it is! love you, thanks for calling me and telling me. Your going to have to knit her something or sew. You are great at both! THat was me, RUthie, Candy was on her blog: iamcandy and I did not realize it! Are those Mide and your toes? Whoo hooo! Congratulations – what fun! And you can call me Auntie Em! 🙂 FINALLY! GiGi! A sweet little baby girl! I am so excited for you. You get to buy pink and ruffles and soft little loveys. Oh, what fun! 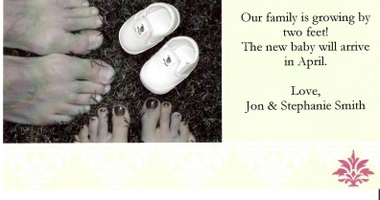 Congratulations to Stephanie and Jon. That announcement is too cute. How incredibly exciting, GiGi!!!!!!!! She is going to be rotten! Gi Gi, I think I should be considered sort of like an aunt. Good to hear from you Robin! And congratulations!! I’m so happy for Steph and Jon! Exciting!! !